Taverna is an open source and domain-independent Workflow Management System - a suite of tools used to design and execute scientific workflows and aid in silico experimentation. The Taverna tools include the Workbench (desktop client application), the Command Line Tool (for a quick execution of workflows from a terminal), the Server (for remote execution of workflows) and the Player (web interface plugin for submitting workflows for remote execution). 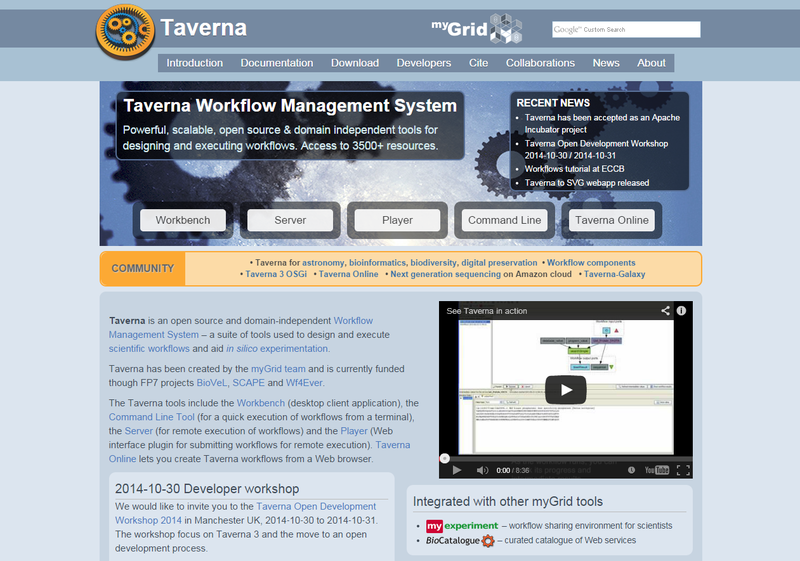 Taverna Online lets you create workflows from a web browser. Taverna has been created by the myGrid team and is currently funded through the EU FP7 projects BioVeL, SCAPE and Wf4Ever.